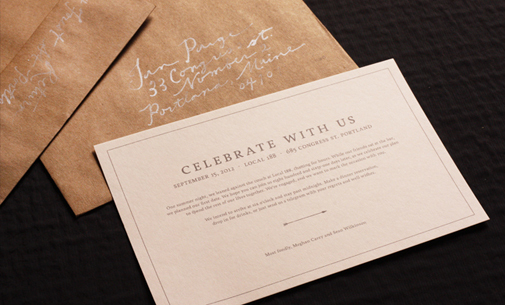 THIS IS THE SECOND IN A SERIES featuring the planning of the September, 2013 wedding of our own Meghan Carey, Vera Wang Fine Papers Art Director, and Sean Wilkinson, co-founder of a design and branding firm in Portland, Maine. For the full story as told by Sean, start at the beginning. Being a designer myself, I knew that the first printed piece, the engagement party invitation, would have to set the tone for the full suite. But we didn’t exactly want to show our whole hand just yet (wait’ll you see the save-the-dates). So we alluded to our vintage camp theme with a subtle arrow motif and a humanist, slightly eroded serif typeface (Livory, designed by Hannes von Döhren & Livius F. Dietzel). Of course, we had some back and forth on the layout, the type styling (we love those discretionary ligatures), and which arrow was just right (I drew at least 11, documented here). A little over the shoulder designing and hovering art direction later, we had a simple and beautiful invitation for our party. We had them offset printed at William Arthur in charcoal ink on soft blush stock (pink enough to be vintage, but not too feminine—no, really). Meghan has great handwriting, so she addressed the kraft paper envelopes in her hand script with white ink in a nib pen. The party itself was at our friend Jay Villani’s restaurant, Local 188. It’s a local favorite here in Portland, and it happens to be the spot that Meghan and I met and planned our first date. There was a great gathering of our friends and family, good food, and lots of drinks (who ordered that last bottle of bubbly?). In fact, we had such a good time, we kind of forgot to take photos."